The joy of cooking Vietnamese food at home is that we can enjoy what we want any time and without having to travel to Eden Center or elsewhere. And the service is pretty good, too. There are a few dishes, however, that aren’t quite ready for their in-home debut. Lau Thai (L-ow Thai), or Thai-style hot pot, is one of those dishes. I don’t have the equipment and haven’t yet looked in to the broth. The future Mr. had a craving for hotpot so after my bootcamp we drove out to Eden Center. 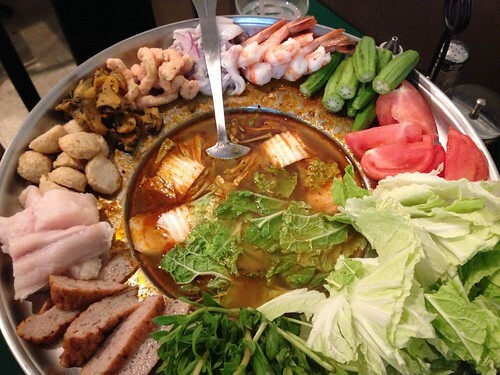 We were shocked to see our go-to hotpot spot Viet Bistro shuttered and empty. Such are the woes of business in Eden Center. Many of the restaurants close after several years (or months) for whatever reason. I hear rent is pretty high and competition is fierce. We turned to another favorite restaurant to give their hotpot a try. Nha Trang is located in the Saigon East section of interior stores – it is Store #8 in the inner corridor through the doors to the left of Princess Diamonds and to the right of Cho Eden grocery store. 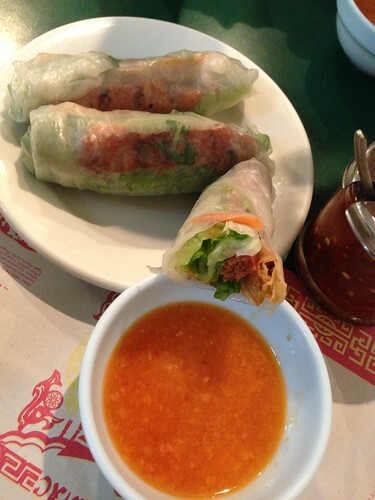 This restaurant has our favorite Nem Nuong (rice paper rolls with grilled pork patties, crunchy eggroll wrapper and the delectable orange dipping sauce). I tried these at home, and they were tasty, but nowhere near as good as Nha Trang. Their Lau Thai comes in either nhỏ (nyaw) small, or large. The small is $35, which is cheaper than Viet Bistro’s, but that doesn’t matter anymore. Small is plenty for two even without other dishes. Their version comes with squid, several types of fish cakes, these weird-wormlike shrimp cake things, fish, shrimp, snail, okra and the other usual veggies. Mussels were missing, which we usually enjoy, but there was plenty else. 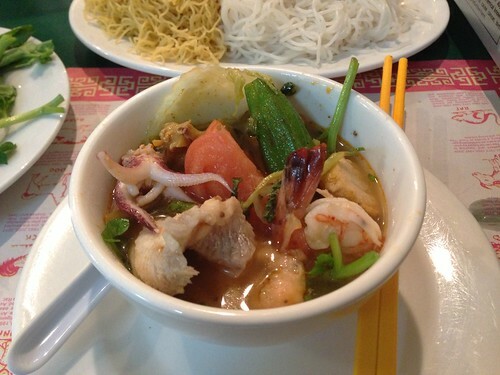 Nha Trang serves their hotpot with both rice and egg noodles. 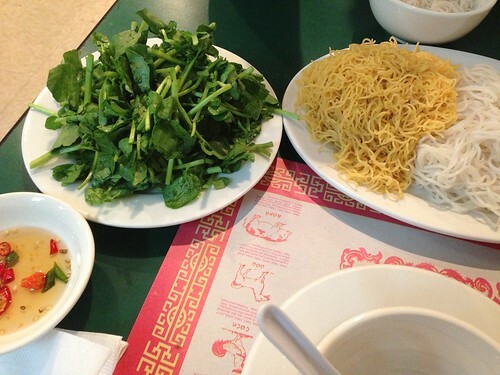 I was a good girl and asked for watercress to eat instead of the noodles. I’m sure the broth has more sugar and salt than I’ve had all week, but making all of the changes and choices I can! Check out this beautiful bowl of tasty bites. The broth is tangy, sweet, sour, and rich. Perfect flavor balance with the peppery watercress, napa cabbage, as well as the strong okra and tomato flavors.